Hiroyuki - what type of noodles are those (wheat, rice, etc.)? It looks lovely. 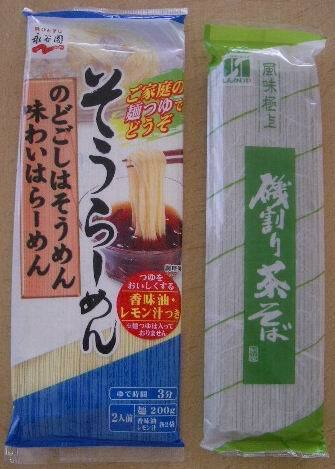 Hiyashi chuka noodles , which are the same as ramen noodles (wheat flour plus kansui (brine water)). In Japan, hiyashi chuka (lit. chilled Chinese) is served in most ramen shops in the summer only, although some shops put it on their menu all year round. As Chufi says, rinsing throughly immediately after boiling is a required step in making a cold noodle dish, or the intended texture (pleasant chewiness) will be lost. I rub the noodles against each other with my both hands to remove the slime from the surface in cold water and repeat this step at least three times until the slime is gone and the noodles are cooled enough. Ume tsuyu for hiyashi chuka or salad dressing - 2 umeboshi (minced), 2 T sugar, 2 T rice vinegar, 3 T shoyu, 1 tsp sesame oil, and 1/2 C water - combined. Also, you can find some information from here. Hiyashi chuka should look something like these. Please forget my poorly presented version. One more thing: I always season the hiyashi chuka (i.e., add the sauce to the noodles) after serving on the table. Anyway, I don't want to have hiyashi chuka that is seasoned tens of minutes before serving because the noodles will already be "stale" by then, absorbing all the sauce. Probably the Japanese are more particular about the quality of noodle dishes than other nations. Here is my (very non-traditional) Vietnamese style noodle salad. There really are noodles under all that chicken and veg.You can see a little peeking out in the lower right corner. And look at the lovely tomatoes. The field tomatoes are finally here. An old favourite last night. I still had some of that raisin/caper emulsion (usually, I would just use vinegar and sugar here, but I wanted to get rid of the raisin/caper stuff). I tossed it into the blender, along with a BIG handful of peanuts, sesame oil, sirricha, minced garlic, minced ginger, and some boxed chicken broth. Blended until smooth. Cooked some dried chinese wheat noodles, only until very shy of al dente, rinsed well in cold water. Added enough peanut sauce until the noodles were "swimming." Cooked some egg "crepes" with shallots, and cut crepes into ribbons. Julienned leftover chinese sausage and green onion, and heated together just enough to wilt the onion. Julienned LOTS of cucumber with mandoline. Then I fried the noodles until they absorbed almost all the sauce and set them aside to cool. When the noodles were cool, I added some more sesame oil, along with the egg, sausage, green onion, and cucumber. Topped with more julienned cucumber, sesame oil, and sesame seeds. I find that, when making cold noodle dishes, if the sauce is quite fatty, cooking the (undercooked) noodles in the sauce is a good way to get them to absorb the sauce, and get coated with enough oil that they don't stick together. The resulting noodles are not "saucy," they appear dry, but don't stick. They are full of flavour. I'm not sure if this method is traditional, but it works for me. It was such a hot day today that I didn't want to do much cooking. So, I decided to make hiyamugi (wheat noodles thicker than somen) for supper tonight. 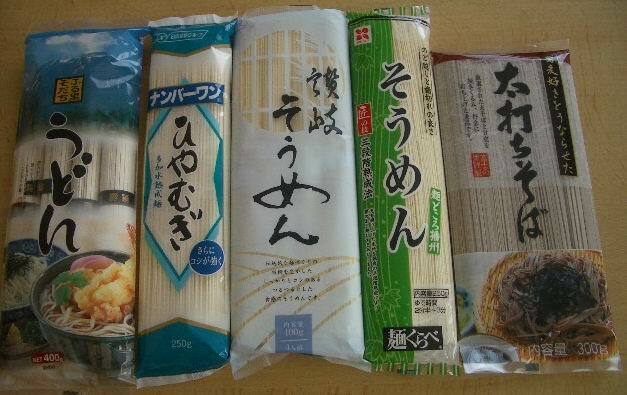 Left to right: Udon, hiyamugi, which I used today, somen, another somen, and soba. I bought some tuna sashimi and squid cutlets. Instead of making dipping sauce for hiyamugi, I used men tsuyu (noodle soup) concentrate. Pan-fried maitake mushroom was the only dish I made for supper. 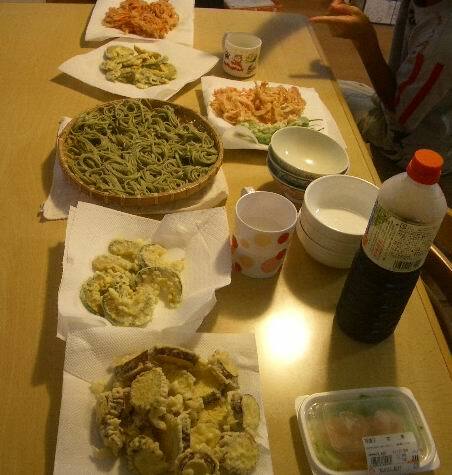 I know that the photos are not worthy of posting here, but I just wanted to show you how hiyamugi is eaten in an ordinary Japanese home. Edited to add a bit of noodle consumption in Japan. 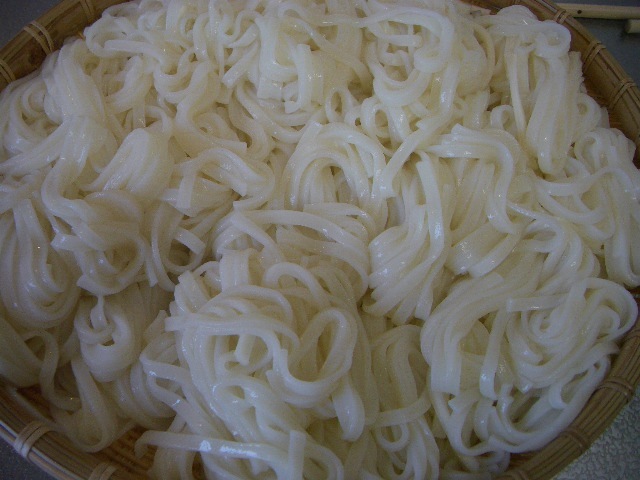 While udon (thickest wheat noodles) and soba are consumed all year around, hiyamugi and somen are mainly consumed in the summer. 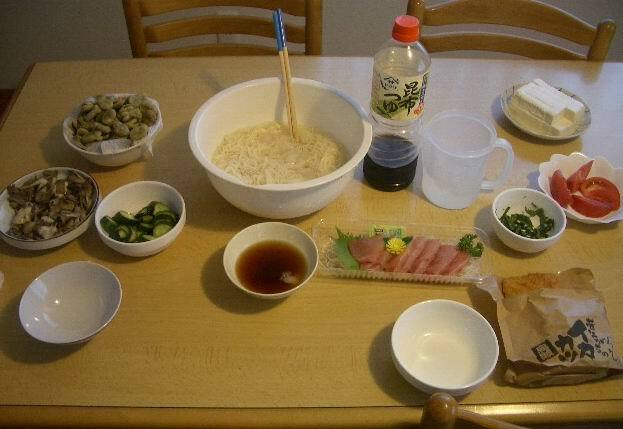 In Japan, all these types of noodles are regarded as shushoku (staple food), like rice and bread, not as a side dish. I much prefer hiyamugi to somen, because it is what I grew up with. (My father prefers hiyamugi). Unfortunately for me, my wife and children all prefer somen, so I haven't had much hiyamugi since I got married. I once googled and found that more Japanese prefer somen to hiyamugi... I just can't believe this! 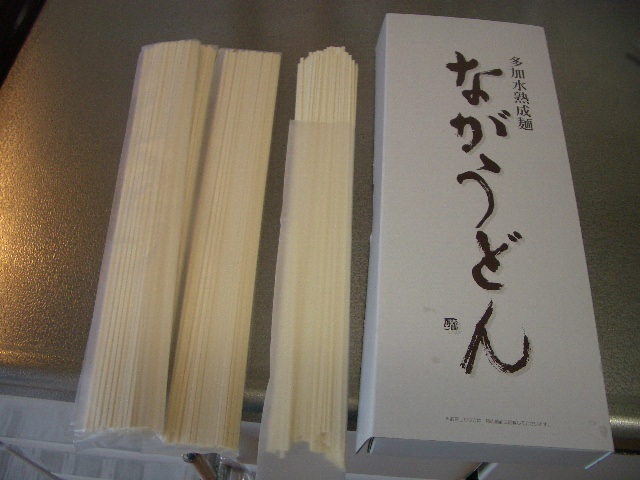 Hiyamugi is thicker and therefore more substantial and tasty, while somen is too thin to savor its texture or flavor, in my opinion. Yes, Hiroyuki, I found Perilla! Thank you, as I would have normally just not purchased without knowing anything about them. I was still not entirely sure, as they were rolled up and bound, but the lady at the market was very helpful, and assured me that this was Perilla. I found them refreshing as well, and almost astrigent. Reminded of licorice, decidedly, and my licorice loving husband really likes them! I made the sauce first, borrowing from severel different recipes: 4 tbs of soy sauce, 2 tbs rice vinegar, several shakes of red pepper flakes, 2tbs of brown sugar, about a half a cup of peanut butter and half a cup of chicken broth, a tbs of dark sesame oil (first time I have ever used the dark - very forceful flavor) and about a teaspoon of grated ginger root. Heated it all up until smooth and creamy, then set aside to cool. I decided to use the Mak gooksoo noodles for this prep, just randomly. I also purchased Bahn Pho, and will play with that another time. The Mak gooksoo came bundled in what I assume are single serving bundles. At least, there were four of them, and the package said there were 4 to 5 servings per package. I used two for me and hubby. To chill the noodles, I put a pyrex bowl in the freezer half full of water before I did anything else. 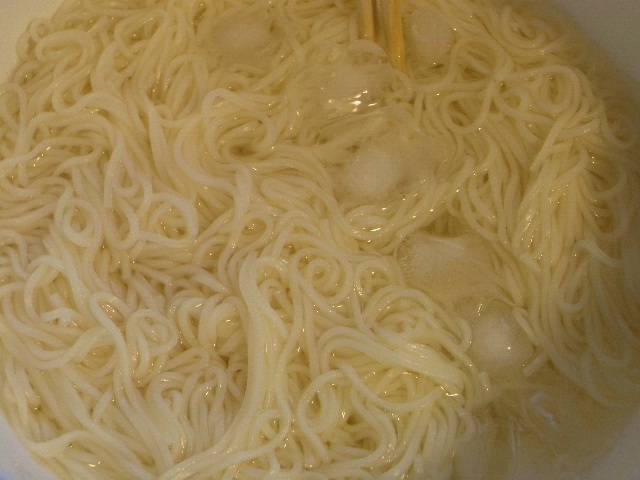 Then when the noodles were done, I drained them, rinsed them, then dumped them into the ice cold water. No clumpy. Then when I was ready, drained them again and poured about half the sauce over them and tossed. Great fun and thanks everybody for your guidance and inspiration. I think I need to explore this area futher! This was relatively easy, and oh so refreshing. Is there another use for the Perilla leaves? I have three bundles left! 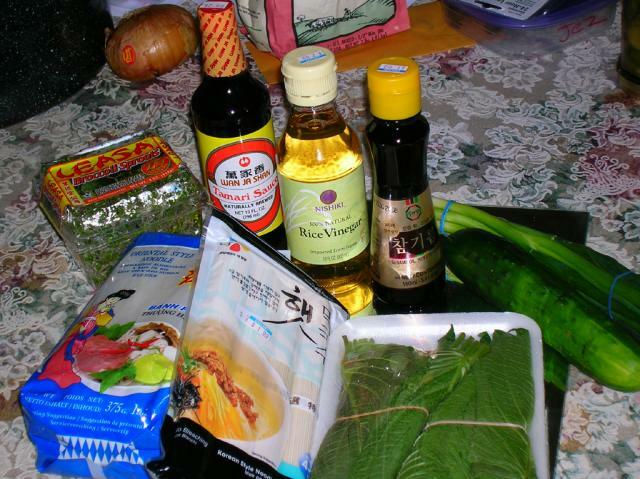 Since it appears that you have the larger Korean perilla, you could use them like lettuce "wraps." Wrap them around bite-size pieces of grilled meat/vegetables, sauces, etc. Even a bit of rice if you wanted. Each diner makes their own "wrap" with their favorite fillings and toppings. Also, chiffonade and add to salads or to top cold tofu. Or toss in warm pasta at the very end, much like basil. Yours looks great, Anne! I wish I could eat some of those shrimp! 3. Shred and put in natto! Or, simply use it like basil, as sanrensho suggests. The flavor is different, but is good. I made my favorite cold noodle dish today -- Orchid's Cool and Tangy Noodles from Barbara Tropp's Modern Art of Chinese Cooking. 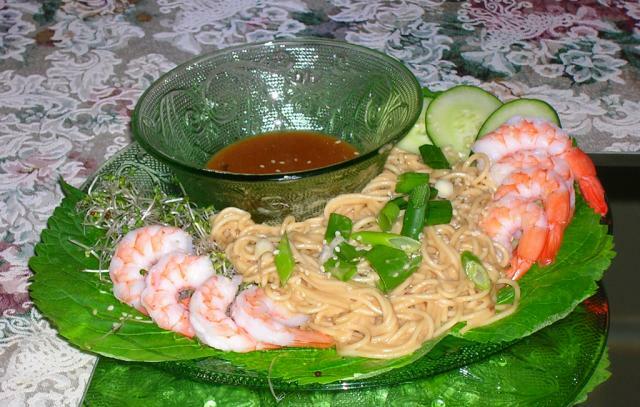 This is a very simple noodle dish, using very few ingredients. It is indeed cool and tangy, and does have a nice kick to it. 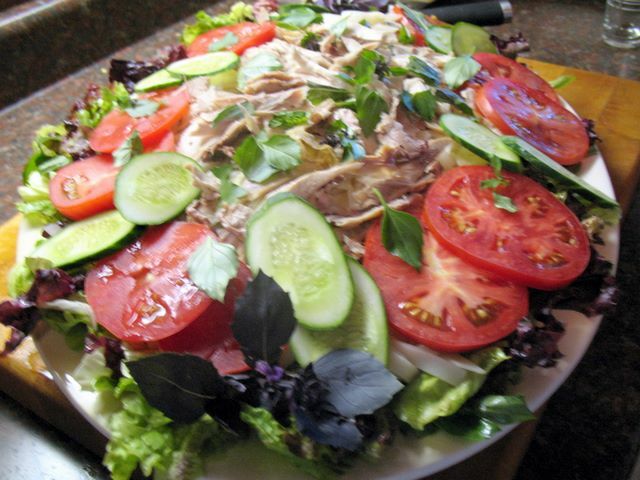 Bonus is that it's a great potluck dish since it is much better actually at room temp! 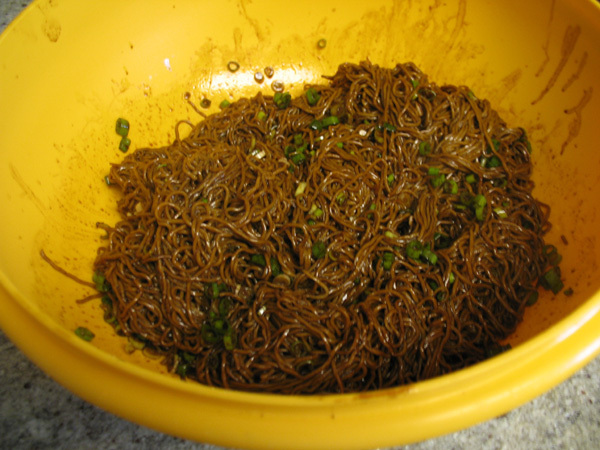 Black soy sauce, Chinese vinegar, sesame oil, chili oil, green onions and noodles. Not shown in this picture is the little bit of sugar and kosher salt. I had some this afternoon as a late afternoon snack, and know what I'll be having for breakfast in the morning. Orchid's Tangy Noodles is a family favourite here, too. My family makes a similar dish, minus the vinegar, but we serve it hot, though amongst the younger generation (meaning me and my cousins), we'll have it at room temp too. My mother would be shocked if I stuck it in the fridge first. I stuck it in the fridge because I made it the day ahead for an event! I made my favorite cold noodle dish today -- Orchid's Cool and Tangy Noodles from Barbara Tropp's Modern Art of Chinese Cooking. snowangel, thank you, again! I always seem to forget about this book and then there's one of your posts to remind me. I made the Orchid's noodles today and they were lovely. Did not have spring onions so I used some very thinly sliced leeks, soaked in hot water to soften them a bit, instead. I'm curious about the noodles. Are they similar to ramen noodles? When this post went up my first thoughts were of the end of a package of rice noodles that were sitting in the back of my cupboard...no pictures, because it turned out looking like the most unappetizing thing ever, but it tasted good so I'm happy. I made the sauce similar to some other people had done: peanut butter, tahini, soy sauce, sriracha, and olive oil and water to thin it out. I mixed it with the softened-and-rinsed noodles, which became the most lovely colour of pale opaque beige. Then I sliced some celery, mushrooms and cucumber very thinly and put that on top, dripped a little more soy sauce and sprinkled on some sesame seeds. But you didn't heat it up again, right? Instead of spring onions, deep fried shallots are a great addition too! Soy, vinegar, ginger, garlic, leftover jus and honey. Finished the sauce with chopped green onion and seranno peppers from the garden. 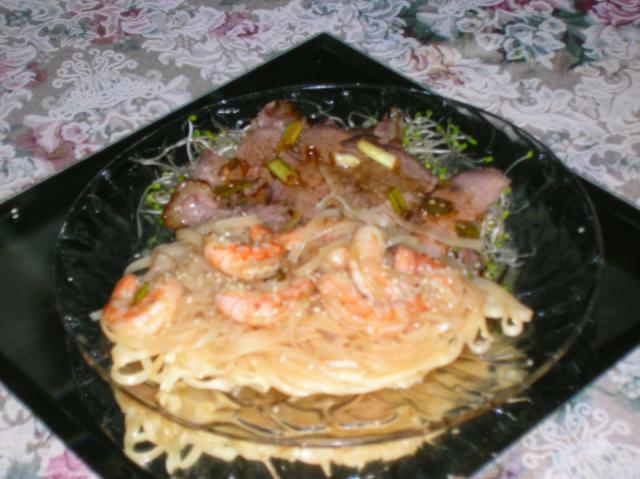 Cold leftover roast beef, shrimp and leftover broccoli sprouts. Hubby is really loving the broccoli sprouts. I could have softened the Pho a bit more, I think. They probably only needed another 30 seconds or so. But very good, and hubby liked this better than the sesame noodles. 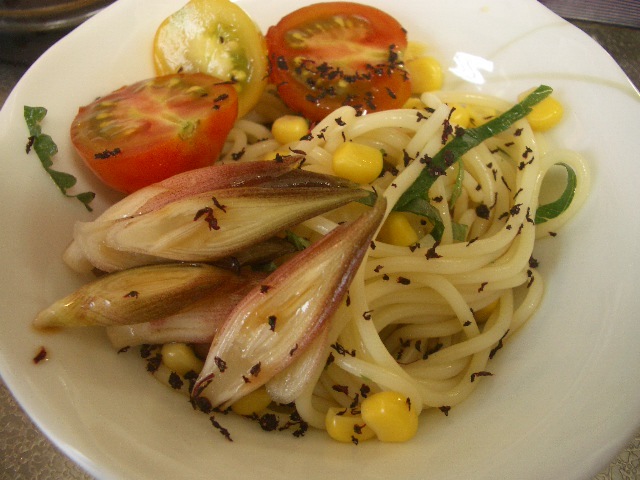 It's been sweltering hot this week, I have made cold udon, cold spaghetti salad, and cold soba. I used this very long, takasui udon that I had received as a gift. Takasui means that a high pecentage of water (> 40%) is added to the flour in the noodle-making process, as opposed to 30 to 35% for regular noodles, to give the noodles a mochi-mochi (mochi-like) texture. Slightly translucent, and tasty. For dipping sauce, I used store-bought men tsuyu (noodle soup) concentrate. with cherry tomatoes, green perilla leaves, corn, myoga (sometimes referred to as Japanese ginger, but the flavor is quite different), and some red perilla leaf furikake (= something you sprinkle over rice). For dressings, I tried the men tsuyu concentrate, ponzu, and mayo separately. 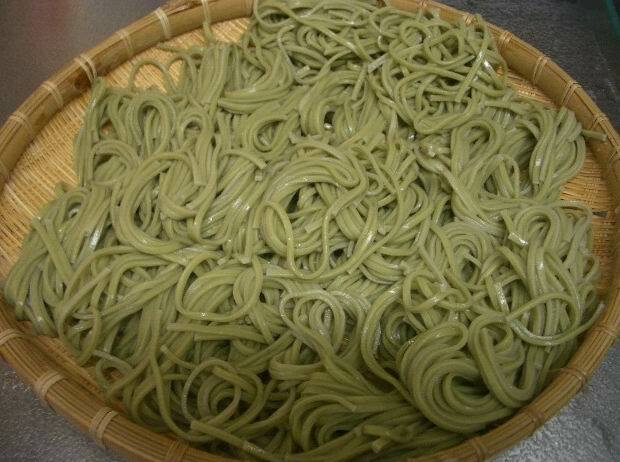 And, yesterday, I asked my children which they wanted to have, somen or soba, and they both replied, "Soba". No photos. Today, I bought two packs of noodles that looked interesting. 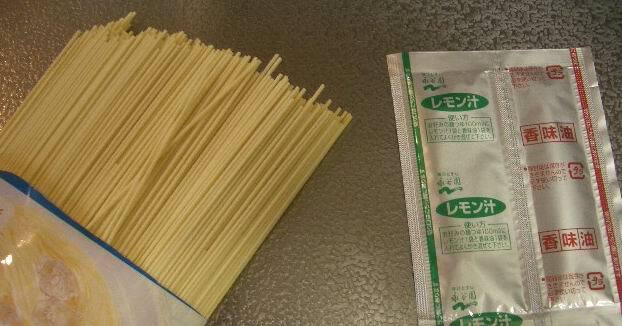 The so-ramen comes with packets of lemon juice and fragrant oil. This evening, I had this lazy meal because I was alone in the house. So-ramen had an interesting flavor, but I wasn't particularly fascinated by it. I think I will have the iso-wari cha soba in a day or two. That is a stunning photograph. It actually got me wanting to make a cold noodle salad, something inconceivable as recently as last night. It also looks frame-worthy. Beautiful. Any other good cookbook suggestions out there? My family had the iso wari cha soba tonight. 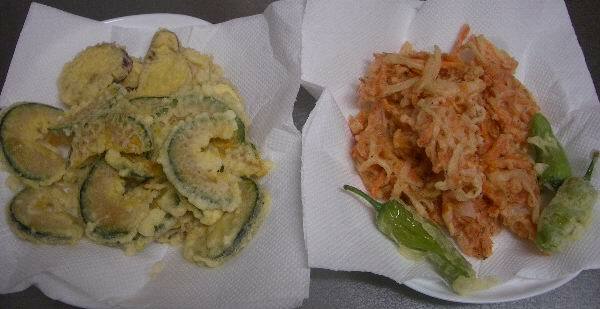 I made sweet potato, kabocha, and shishito (a type of green pepper) tempura and carrot-onion-small shrimp kakiage. In Japan, soba is often served with tempura. Iso wari cha soba had an intense flavor of green tea powder. I was unable to discern the flavor of the seaweed, which probably contributes more to the texture of the soba. Thanks! 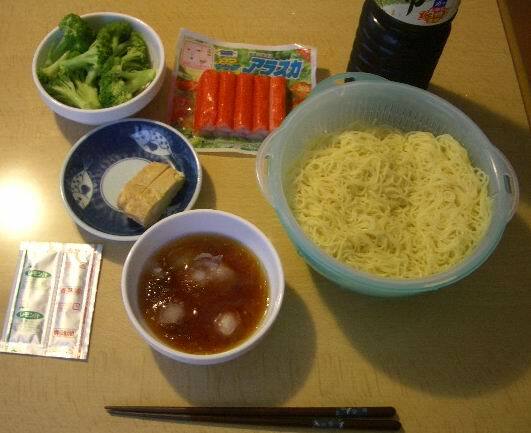 I'm going to make wafu (Japanese-style) reisei (cold) spaghetti pretty soon! 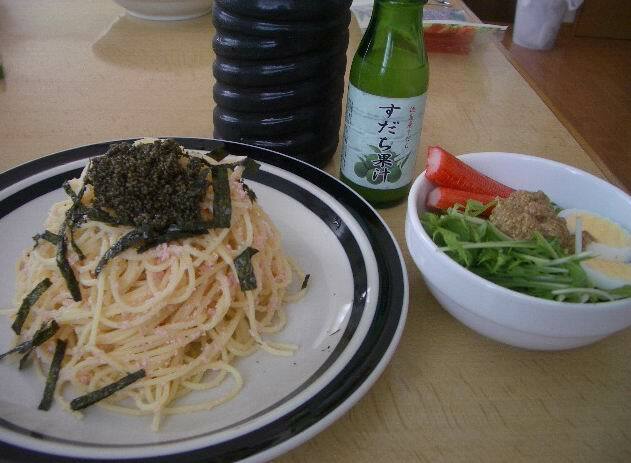 I made Japanese-style cold spaghetti for lunch today, but unfortunately, it wasn't very successful although I used two special ingredients for this cook-off, sudachi juice and tonburi. 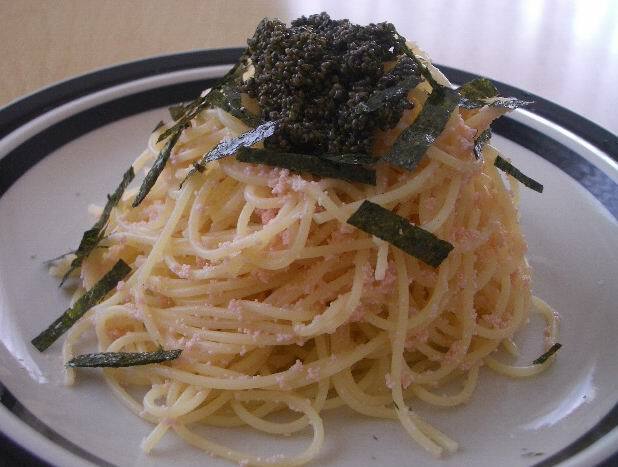 Cod roe spaghetti topped with tonburi. Expensive sudachi juice in the small bottle on the right. On the left is noodle soup concentrate. I poured them immediately before eating (my favorite style). Having been alerted to this thread here's my first contribution. Summer in London comes in batches, we just had our first attempt at this elusive season. In celebration I made cold noodles three days in a row. The first was a Vietnamese inspired rice noodles and shredded cabbage dish to celebrate my purchase of real Vietnamese Fish Sauce (considerably harder to come by than the Thai kind). 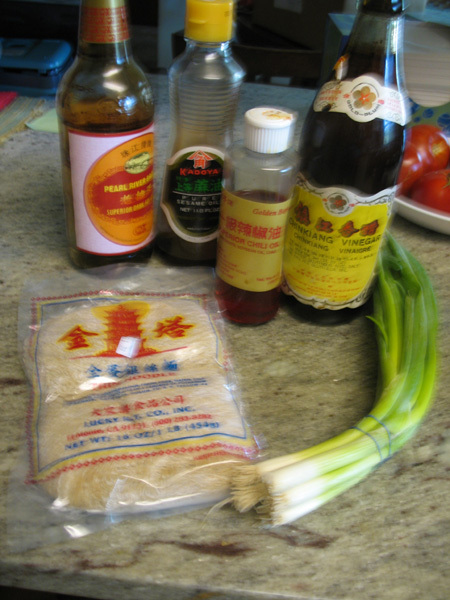 I like the Vietnamese Sauce more for raw and cold dishes, the Thai stuff is wonderful with cooked/hot food. After that I made two very different stlyes of Hiyashi Chuka. So far this year at least two of us have made cold noodles. Now I know this thread exists I'll take some photos of my next attempt. Weather has cooled already in London, hopefully we'll have another installment of Summer before the year is out and I'll make more.